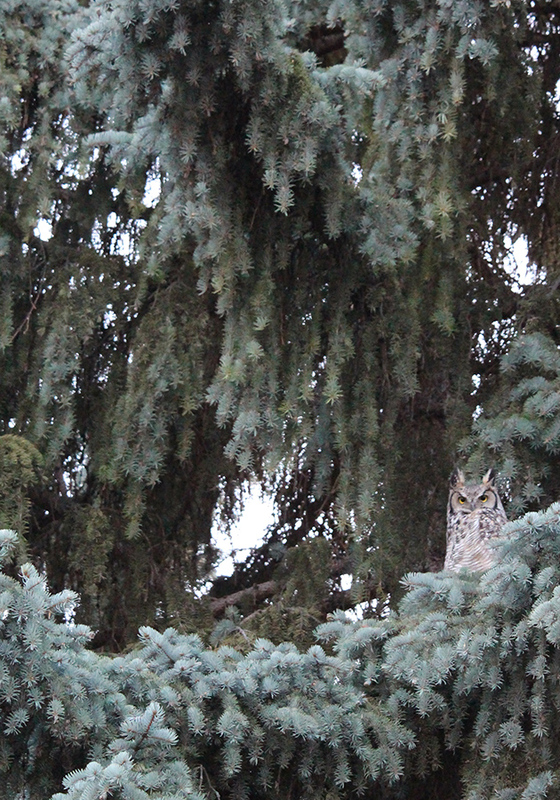 I photographed this Great Horned Owl just across the street from us in Parkallen, Edmonton, Alberta. The crows on our block were upset about this visitor and screaming bloody murder, which drew our attention to this bark-coloured and silent raptor high in a mighty, old blue spruce. A beautiful picture of the owl and the blue spruce. I would think that it should entered somewhere in a photo competition of some sort. I love it. Thanks, mom. I’ll keep my eyes open for something appropriate. I tried to read your blogs but I can’t login all of a sudden. I have in the past. Have you changed mediums (ha I mean blogg/computer company) and I just need to start a new ‘account.’ Or can you “invite” me. You can’t log in to leave a comment you mean? You shouldn’t need to login to see the blog.